All children, animals and people of all ages from 2 to 102 year olds! Animalphabet The Musical High-energy actors, colourful puppets, amazing characters and fantastic songs combine to create AnimAlphabet The Musical. Join Colin the Country Cockatoo, Hip-Hop Donkey and Geoff the Geordie Jazz Giraffe on a fantastic family musical adventure. 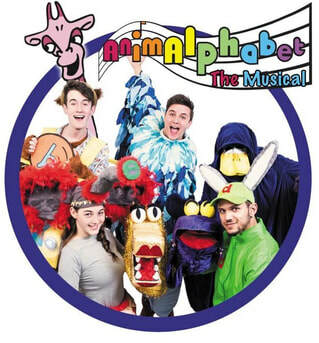 AnimAlphabet is funny, fast-paced and bursting with witty songs by Al and Sam of double platinum pop band The Hoosiers and featuring Kerry Ingram (NETFLIX Free Rein, Game of Thrones, Matilda The Musical) as the voice of MetroGnome. AnimAlphabet is a fun family musical unlike any other but you better watch out, that dastardly duck Calando's about!